The first TV was invented by John Logie Baird. In 1924, he received the televised images in which can be distinguished only contours of objects. During 1925 make up the system and in 1926 make the first demonstration at the Royal Institution with a black and white TV. Also in 1926 makes his first television transmission of some moving pictures. 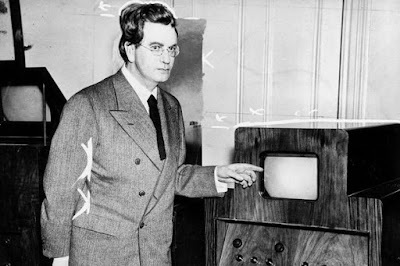 John Logie Baird showed in 1928 that transmitted images could be played in colors.